Common this orchid may be, but it is no less beautiful for that. The variations in colour and lip-markings between specimens bear testimony to the visual diversity that can be seen in a single orchid species. 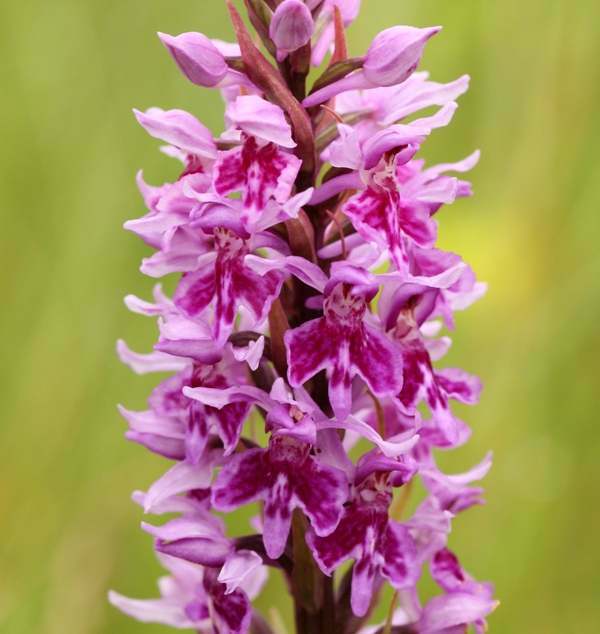 This orchid usually grows to between 20cm and 50cm tall, but specimens up to 70cm in height can sometimes be found; this makes it generally taller than the Heath Spotted-orchid Dactylorhiza maculata with which it is often confused. The lip of the Common Spotted-orchid has an exaggerated central tooth. Found throughout most of Britain and Ireland, the Common Spotted-orchid can be seen in many countries of mainland Europe including Slovenia, where it grows in its thousands on roadside verges. 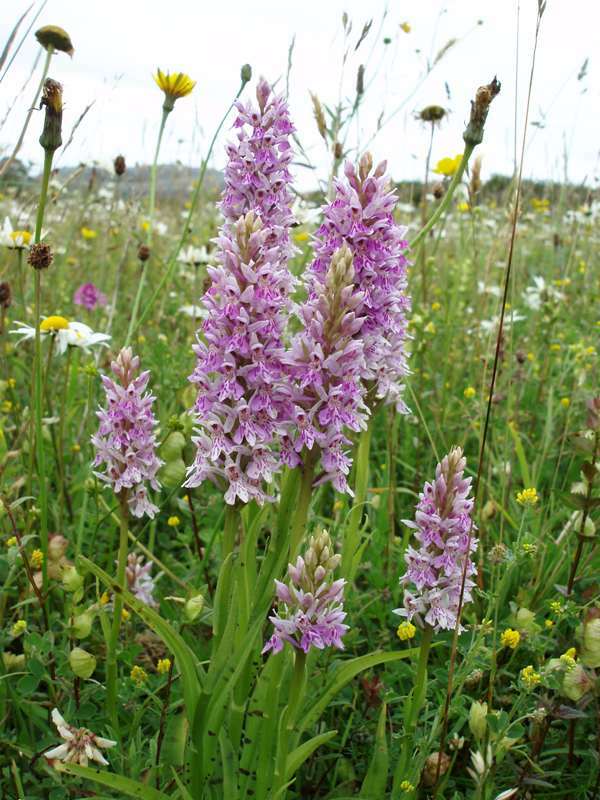 This orchid is very common in Wales, where we live, and pops up all over the place - in the sand dunes at many of our coastal nature reserves, on roadside verges, roundabouts and central reservations (they thrive there because of the limestone chippings used to assist with drainage) as well as in unimproved grassland sites. 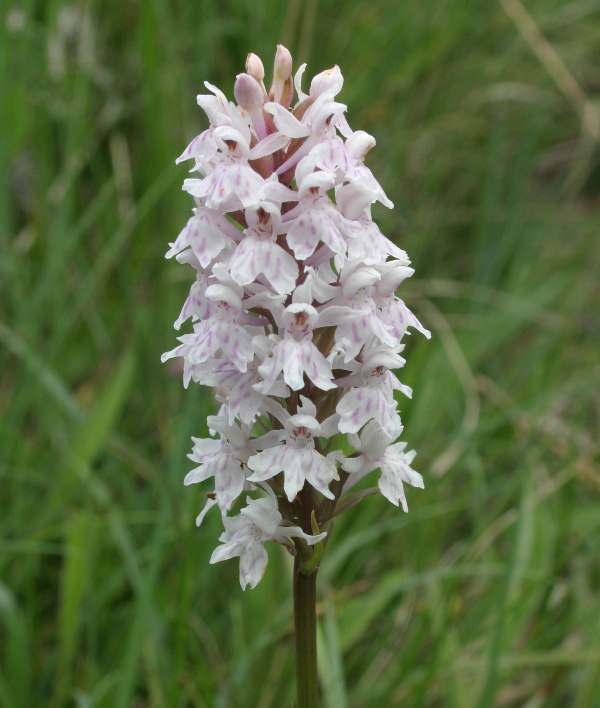 Provided the soil conditions are calcareous and the ground has not been doused with pesticides and herbicides you are quite likely to find the Common Spotted-orchid. 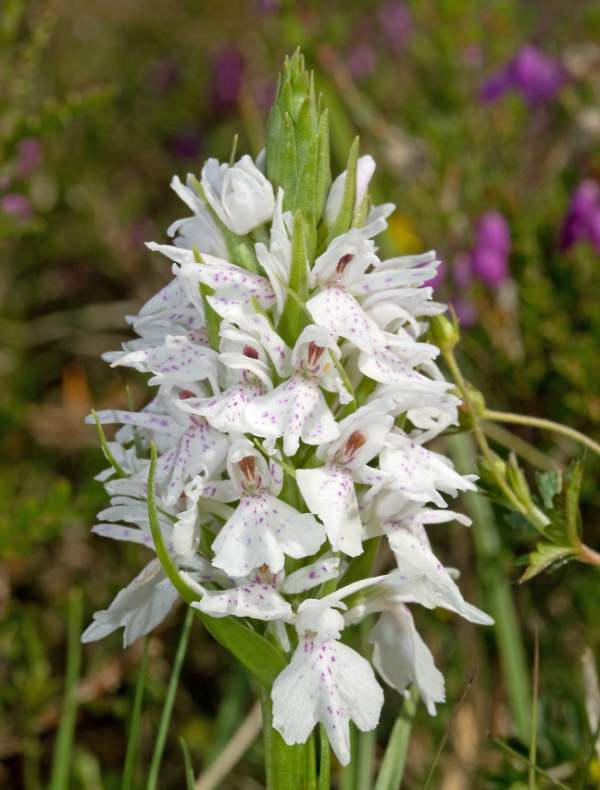 In Britain and Ireland the peak flowering time for Common Spotted-orchid is June. Also found in Wales are the hybrid with Southern Marsh-orchid Dactylorhiza praetermissa, - Dactylorhiza fuchsii x grandis - and the variety Dactylorhiza fuchsii var. rhodochila. The latter is rare, while the former is probably very common but may be easily confused with either or both parent plants. Dactylorhiza fuchsii x grandis is a tall and robust plant with darkly-spotted leaves and deep-pink flowers. It is found where both parents occur, and occasionally where they apparently do not. This hybrid plant is capable of producing seed, and so hybrid swarms sometimes occur. 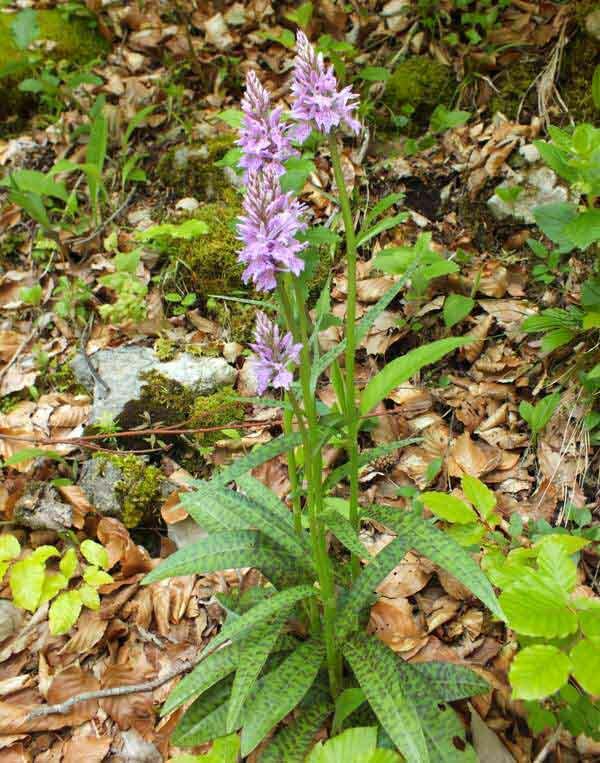 Dactylorhiza fuchsii var. rhodochila is widespread throughout the UK but rare. The leaves of the plant are more heavily spotted and are also sometimes reported as being almost completely purple. The lip of the flower is also a distinguishing feature, having a block of dark purple colouring, due to excessive pigmentation, in the centre and with a paler border. The specimen shown on this page was photographed in Wales in June.